IO Ninja is not freeware. You may evaluate IO Ninja free of charge as long as you need. However, if you keep using it, you must purchase a non-evaluation license and register your copy of IO Ninja. This license is for a single person working with IO Ninja. With the purchase of this license you fulfill our license agreement, get rid of all reminder screens and banners, and support the development of future versions of IO Ninja. This license is for a workgroup working with IO Ninja inside the same company. The same license can be used by all members of the workgroup. Additionally, owners of workgroup licenses are eligible for priority support and better discount options when purchasing the IO Ninja hardware equipment. I2C/SPI Tap is an affordable sniffer for monitoring I2C and SPI communications. This device works in tandem with the I2C/SPI Tap plugin. All the prices below include delivery of an I2C/SPI Tap package to your door, so there are no hidden costs. This is the default option for purchasing an I2C/SPI Tap. Includes free shipping, a USB-C cable, and a single-user licence for IO Ninja. This is a discounted combo for users who want to purchase an I2C/SPI tap plus a workgroup license. Includes free shipping, a USB-C cable, and a workgroup licence for IO Ninja. This discount deal is available for customers who already have a valid single-user license for IO Ninja. Includes free shipping and a USB-C cable. This discount deal is available for customers who already have a valid workgroup license for IO Ninja. Serial Tap is an affordable sniffer for monitoring RS-232, RS-485, and TTL-level UART communications. This device works in tandem with the Serial Tap plugin. All the prices below include delivery of a Serial Tap package to your door, so there are no hidden costs. This is the default option for purchasing a Serial Tap. Includes free shipping, a Serial Tap, a USB-C cable, two DB9 gender-changers, and a single-user licence for IO Ninja. This is a discounted combo for users who want to purchase a Serial tap plus a workgroup license. Includes free shipping, a Serial Tap, a USB-C cable, two DB9 gender-changers, and a workgroup licence for IO Ninja. Includes free shipping, a Serial Tap, a USB-C cable, and two DB9 gender-changers. For a limited period of time we offer a discount for a set containing the two Taps we offer — the Serial Tap and the I2C/SPI Tap. This is a discounted combo for users who want to purchase a Serial Tap and an IC2/SPI Tap. 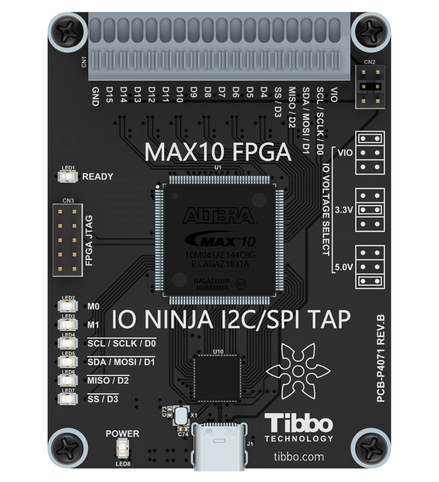 Includes free shipping, a Serial Tap, an IC2/SPI Tap, two USB-C cables, two DB9 gender-changers, and a single-user licence for IO Ninja. This is a discounted combo for users who want to purchase a Serial Tap, an IC2/SPI Tap, and a workgroup license. 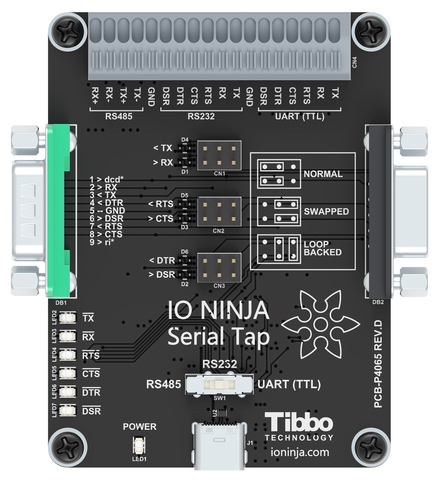 Includes free shipping, a Serial Tap, an IC2/SPI Tap, two USB-C cables, two DB9 gender-changers, and a workgroup licence for IO Ninja. Includes free shipping, a Serial Tap, an IC2/SPI Tap, two USB-C cables, and two DB9 gender-changers.